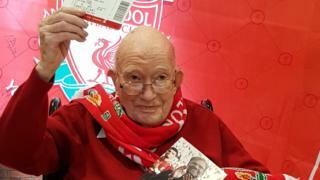 One of Liverpool FC's longest serving fans is being treated to a day watching his beloved Reds for his 104th birthday. Bernard Sheridan was presented with a personalised note signed by manager Jurgen Klopp and an invitation to this Saturday's Premier League match at Anfield against Crystal Palace. Mr Sheridan has been faithfully following the club for 96 years. He said: "The icing on the cake will be when we beat Crystal Palace." Representatives from the club paid a surprise visit to Mr Sheridan at The Tithebarn care home in Great Crosby, Sefton, Merseyside, this week to present him with his birthday gifts. They included a shirt with the number "104" printed on the back, a cake and the letter from Klopp thanking him for his support since 1923. Mr Sheridan, who has seven grandchildren and fourteen great-grandchildren, will attend the match with family, including a son who is travelling to Liverpool from Canada. He began watching Liverpool and local rivals Everton in 1923 when an uncle started taking him to games on the tram from their home in Wavertree each week and a love affair with the Reds soon formed. Mr Sheridan added: "I've been a proud Liverpool supporter since I was a boy and have supported the club through thick and thin, so I'm absolutely thrilled to be off to the match on Saturday."